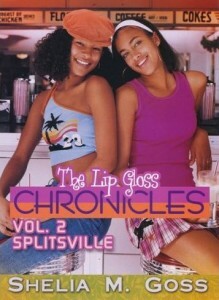 First, let me say, as a teen I would have totally picked up a book called The Lip Gloss Chronicles. Because for reasons unknown to mankind, some girls are mesmerized by lip gloss. I was am one of them. My five-year-old has a terrible addiction to it, already. Whether it’s in the chapstick tube form or (more commonly) in some type of pretty, heart shaped or Hello Kitty-shaped container – she wants it! So, in my opinion, author Shelia Goss had the right idea when she named her teen lit series after the much sought after fashion product. But, readers beware – YA named after gooey, shiny lip condiments is no less packed with depth than some YA with pouty, models on the cover. There’s depth in them there pages. Goss grounds the LGC in real-world issues for readers craving substance with their multi-culti pop lit. The Lip Gloss Chronicles follows three friends, Britney, Jasmine and Sierra as they make the transition from an elite private school to public school. The girls are Texas socialites ready to be fed into the dog eat dog world of average joe students. The drama includes the three friends being attracted to the same guy, coping with divorcing parents and weight issues. A national best selling author for her adult fiction, Goss is no stranger to the lit world. I caught up with her to talk about life on the teen side of the field. Comment by 9 p.m. Eastern July 29th and you’re eligible for a drawing to receive a copy of Lip Gloss Chronicles vol 1. The Ultimate Test. So, give Shelia a big Brown Bookshelf welcome and comment away! new genre or does your prior success lend you a bit more confidence? SG: I’m excited to be writing in the YA genre. I have to admit that it was scary at first. My biggest challenge has been figuring out how to get the word out to teens so they’ll know that my books are out there. writing adult fiction, for you? SG: The major difference was making sure the storylines were based on the reality of today’s teenagers and not write about adult themes. I had to speak with teenagers and learn their lingo. BBS: How has it been the same? SG: I try my best to not just entertain, but have a message in each one of my books whether it’s women’s fiction or young adult. SG: I’ve read some teen books where the characters have gone from public school to a private school. I wanted to show what would happen if the opposite occurred. BBS: And why three characters versus one trying to maneuver the same obstacle? SG: Britney, Jasmine and Sierra each have unique personalities and handle situations differently. I also wanted to show the bond between friends that can last a lifetime. other young girls (African American or otherwise) in today’s suburbs. I find them very relatable. How have readers reacted so far? SG: I’ve received positive feedback from readers (adults and teens). Most of my friends live in the suburbs so the world I created for Britney, Jasmine and Sierra is not just fiction. Their fiction world is a reality for many teens that I know. BBS: What’s the buzz on your books from them? SG: Parents are telling me that some of their kids who don’t usually read much are now asking for book two in the series. That’s a good sign. to stay grounded in pop culture that appeals to the teen reader? SG: I freelance as an entertainment writer so that has helped me; but my best research has come from talking with my pre-teen and teenage cousins. too far to lose weight? SG: Sierra’s weight issue is both internal and external. She hears remarks from her best friend Jasmine as well as her own internal voice telling her she needs to lose weight. Although in Paper Thin, Sierra has lost twenty-five pounds, she still feels like its not enough and ends up taking diet pills that lead to some health problems. SG: I decided to tackle this issue because many teenage girls are struggling trying to look like unrealistic images they see in various forms of the media. The theme for Paper Thin is that it’s okay to be healthy at a normal size. It’s not meant for every girl to be a size zero. I also wanted to show the dangers of taking drastic measures to lose weight. you think it will take to see more books like them out there? SG: Exposure. Although I’m aware of the AA YA books out there, many of the people I talk to are not. I have compiled a list of AA YA authors and give the list out to those people I come across. I’m still new to the genre, but I think more media exposure and building relationships with librarians will help. BBS: How many books planned in the series? SG: There are currently three books in the series: The Ultimate Test (May 2009), Splitsville (September 2009), and Paper Thin (Spring 2010). I would like to see this series follow the girls until high school graduation. That all depends on how the sales are for the first three books in the series. BBS: Do you have plans for other YA outside of the series? SG: Yes and I’m real excited about it. I’m still working on a proposal for it, so I can’t go into any details right now. I hope the readers will embrace it just like they have The Lip Gloss Chronicles. This interview was conducted by Paula Chase-Hyman, author of the Del Rio Bay series, who still can’t bypass prettily packaged lip gloss! Great interview. Sounds like just the book I need to check out. There needs to be more books about suburban black teens. Going from a private school to a public school is something that happened to me so I’m interested in reading about it! Awesome. What is it about lip gloss and why do I feel the need to carry 3-4 different ones in my purse?! Congrats Shelia! I know that your YA books will be well received. The topics that you focus on are needed for today’s teenagers and I wish you continued success. BIG Congratualtions! LSC sounds perfect for today’s teenagers. This is a book that as an adult who loves to read, I think that I will enjoy. This sounds like a great series to share with my middle school students. One thing I’d love to see: including the publishers, even highlighting the publishers, who are bringing out great books with characters of color. Some publishers are getting a lot of negative publicity right now around race and YA; let’s notice the ones who are doing good, as well. 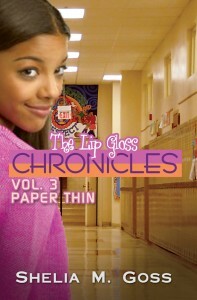 Lip Gloss Chronicles are from Urban Books, an imprint of Kensington Books. This will also make it easier for readers to “Be Counted” as you recommended in a previous post. Also, on the Brown Bookshelf Teen Lit page we link to ReaderGirlz, Our Teen Voices and Teens Read Too, all great pathways to diverse books. Hip hip Hooray. I am very proud for you. As an educator, I would be honored to use your books to reach my young readers. Thanks for the review of such interesting books! I’ve added them to my list of things to buy as soon as school begins again! Thanks all for taking the time to read the interview. For the teachers and/or librarians, I am available for conference calls to speak with students. The winner of the copy of the LGC vol. 1 is Lauren. Lauren, can you email me your snail mail address, please?